Bitter Apple Spray There is 1 product. Bitter apple is a non-toxic, safe and effective chew deterrent. 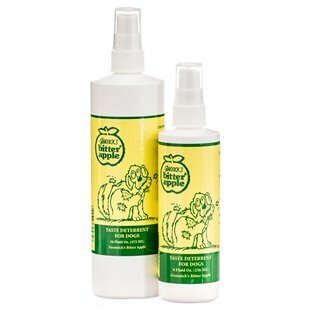 Bitter apple spray has a bitter taste to discourage pets from licking, gnawing, and chewing on surfaces where applied. One application is usually sufficient to solve the chewing problem. repeat if necessary. can be used with any animal dogs, cats, rabbits, ferrets etc. Ingredients: water, isopropanol 20%, bitter principles, and extractives.